Class AAAAAAA: Two Forsyth County teams took first place in the state’s largest class, winning each program’s first-ever titles. The Lambert boys (1:24:44.05) denied Marietta (6th place) a third straight title in the state’s largest class, and the South Forsyth girls (1:41:07.42) won comfortably over the next-closest competitor, Brookwood (1:44:30.84). Milton’s Sam Bowers (16:06.57) took the boys title with Hayden Tullos (16:10.45) and Ben Patterson (16:19.07) of Marietta in second and third, and Liz Galarza (18:58.66) of West Forsyth won for the girls with South Forsyth’s Kaylee DuPont (19:17.32) coming in second. Class AAAAAA: The Alexander boys (1:25:18.82) won their second title all-time and first since 2000 thanks to two top-five finishes and a state title by Braeden Collins (16:16.08). Second-place Allen Clark (16:30.98) of Lakeside-Evans (5th place) was one of two Lakeside runners in the top five. Second-place Kira Stanley (19:52.88) was the top finisher for the Harrison girls (1:42:58.34), and Nyah Hernandez (19:30.25) of Creekview won the individual title. It was the Harrison girls’ first state title since consecutive championships in 2000-01. Class AAAAA: The Clarkston boys (1:28:44.81) won their third straight Class AAAAA title and third all-time as No. 7 Bineyam Tumbo (17:12.86) was the Angoras’ top finisher. Decatur’s Sam Ellis (16:38.61) took first place. Woodland-Cartersville (1:45:09.52) was a first-time winner on the girls side with two top-10 finishes and No. 5 Carli Clymer (20:09.82) the top runner. Erin Leonard (19:17.97) of Jones County won the individual title. Starr’s Mill took No. 2 in both the boys and girls races. Class AAAA: DeKalb private schools swept Class AAAA on Saturday. The St. Pius X boys (1:24:23.89) won with three top-10 runners within seven seconds of each other, with No. 5 Frank Crippen (16:42.80) leading the way. Ben McCoy (16:24.11) of Blessed Trinity (3rd place) took the title. The Marist girls (1:39:51.64) won going away, with title-winner Josie Wirtz (19:15.00) and two others in the top 10. It’s the St. Pius boys’ ninth title and the Marist girls’ 18th. Class AAA: The East Jackson boys (1:24:48.27) won their first title with two top-10 runners and state champion Chase Kennedy (16:01.58) winning by over 40 seconds. Westminster, which finished second on the boys side, won the girls title (1:39:38.97) thanks to second-place finisher Delaney Graham (18:49.47) and the seventh- and eighth-place runners. Lovett’s Serena Tripodi (18:17.85) won the individual title. It’s the Westminster girls’ 29th state title. Class AA: Bleckley County swept, with the boys (1:31:18.51) edging out No. 2 Banks County (1:32:05.86) and the girls (1:59:08.41) besting No. 2 Rabun County (2:00:42.78) for team honors. Carl Ellis Corley (17:19.48) of Bleckley finished No. 1, with three Bleckley runners in the top 10. Macy Moe (22:04.21) took third for the Bleckley girls, and sisters Mari (21:37.18) and Alina Jablonski (21:52.90) of Monticello (non-qualifier) took first and second. 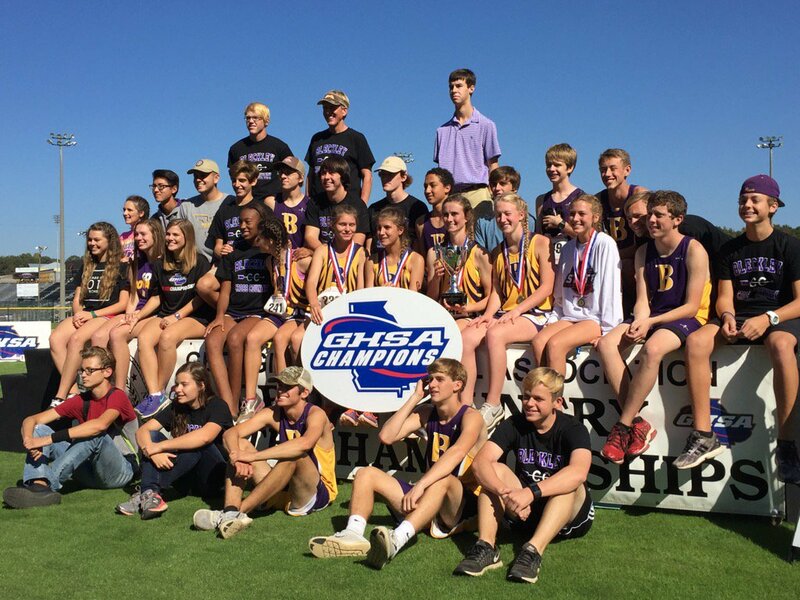 It’s the Bleckley boys’ second-ever title and second in a row, and it’s the girls’ first. Class A-Private: Landmark Christian pulled off a sweep in Friday’s first races. The Landmark boys (1:29:44.21) took the title with three runners in the top five, with Seth Cruver (17:13.80) and Kermit Jackson (17:39.38) of Landmark finishing Nos. 1 and 2. The girls (1:40:03.76) had four top-10 runners, with Nicole Fegans (18:36.20) of Landmark taking the title. It is each program’s 10th state championship. Class A-Public: The Georgia Military boys (1:34:46.43) took the top two spots with Hunter Kimball (17:26.99) winning big and Aaron Kirkland (18:15.35) finishing second. It’s Georgia Military’s third boys title, winning in 2012-13. Towns County’s girls (2:04:13.96) won, with ninth-place Hannah Whitehead their top runner. Alli Hay (20:57.28) of Pataula Charter (non-qualifier) finished first.